Our next destination is a pilgrimage. 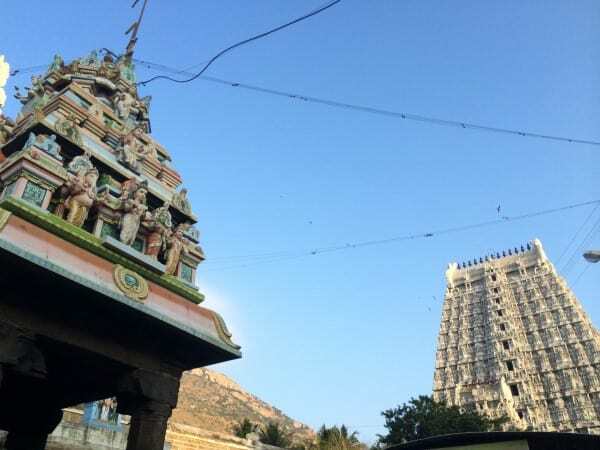 Tiruvannamalai is one of the five elemental cities of Shiva in South India. 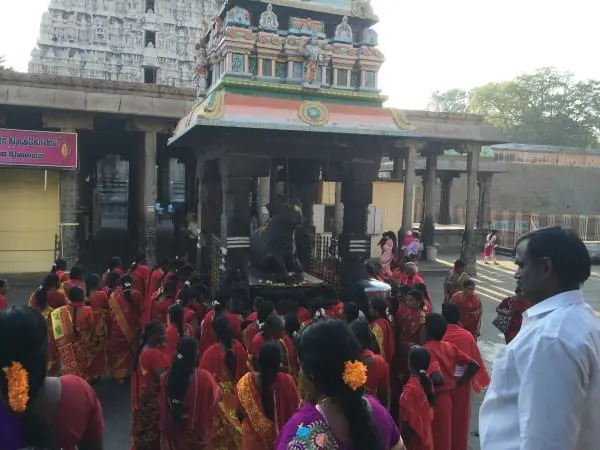 Set under the mountain of Arunchala, Shiva is worshipped as Arunachaleshwar. 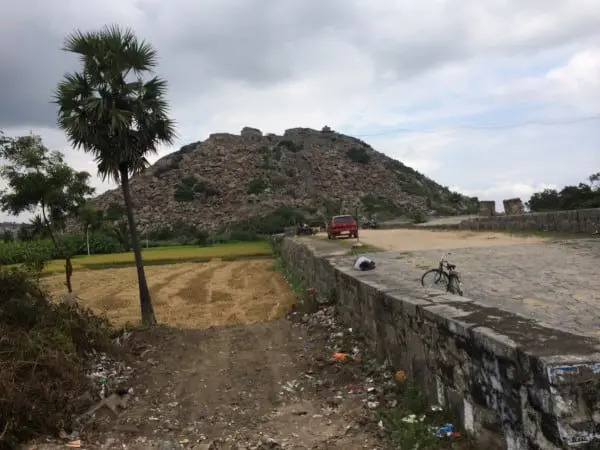 Our Pilgrimage is to the temple of the same name, and the pilgrims walk, circling the base of Arunachala. 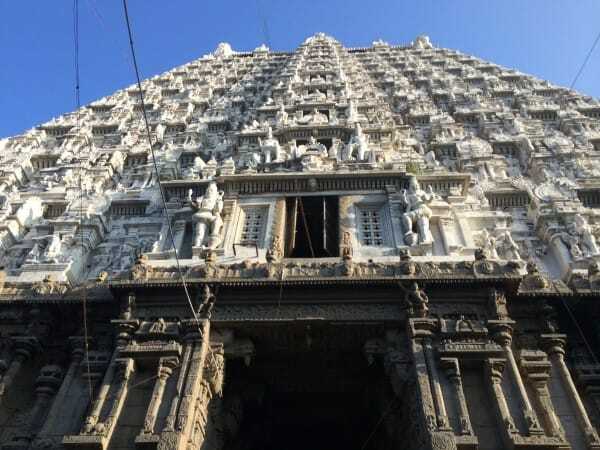 This is the Giravalam. It’s our first real local Indian bus. Now that doesn’t mean that, stereotypically, there are people on the roof, but by the time we arrive there are certainly folks everywhere else. 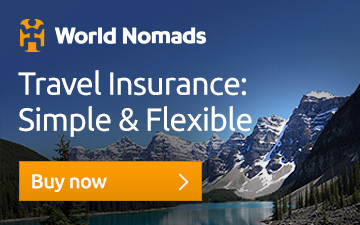 It’s pretty much the same as it was in Sri Lanka. It’s not designed for people carrying backpacks, but mostly we’re being ignored. 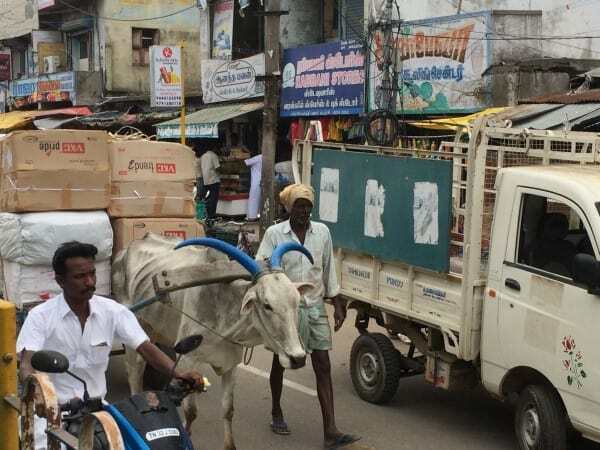 It’s a great opportunity to see life on the move, from Mercedes to cows pulling carts, the gap between rich and poor is incredibly stark here. 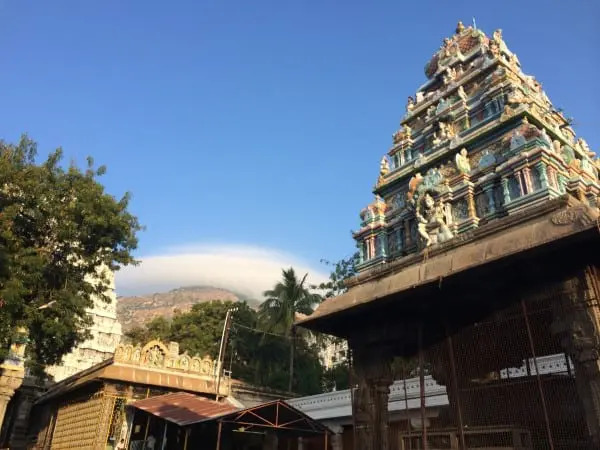 Tiruvannamalai – often Thiruvannamalai – is a temple mountain town set below Mount Arunachala. 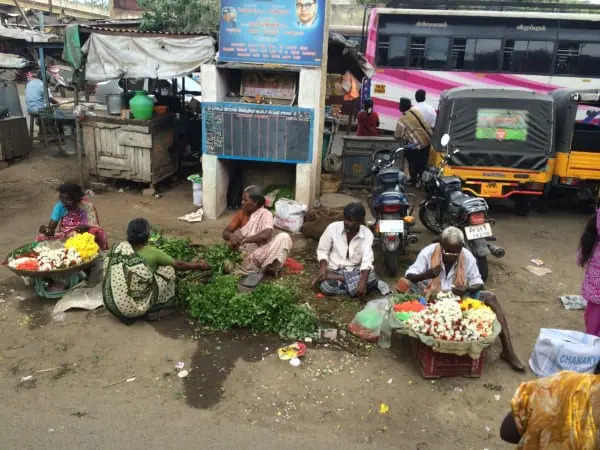 The town is one of the five elemental cities of Shiva in South India. 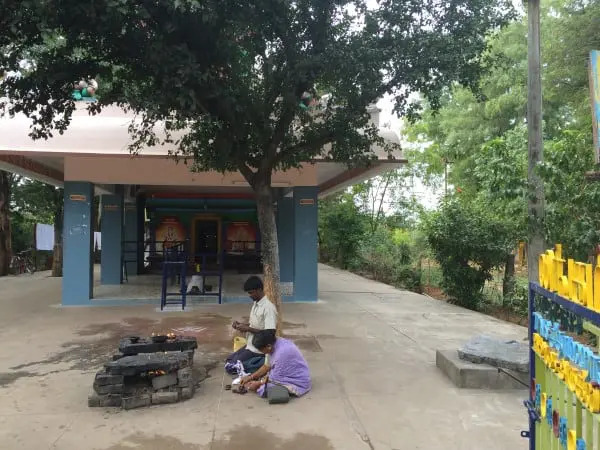 Here, he is worshiped in his fire element, as Arunachaleshwar. 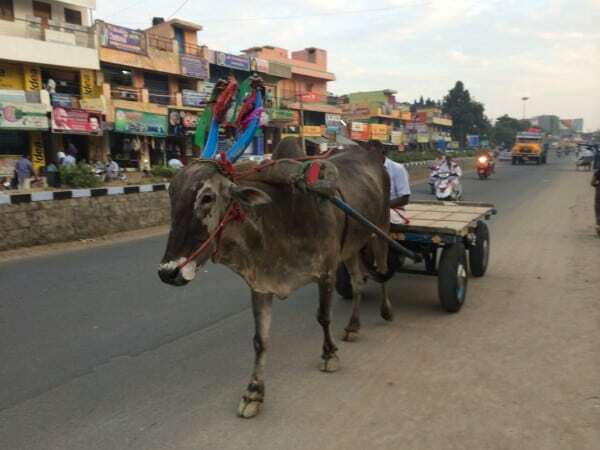 We’ve missed full moon, which sees the town swell with thousands of pilgrims who come to “walk the Giravalam”. While it’s not full moon, that’s also what we intend to do. En route there’s a clear reminder as to why you should lock your bike.. 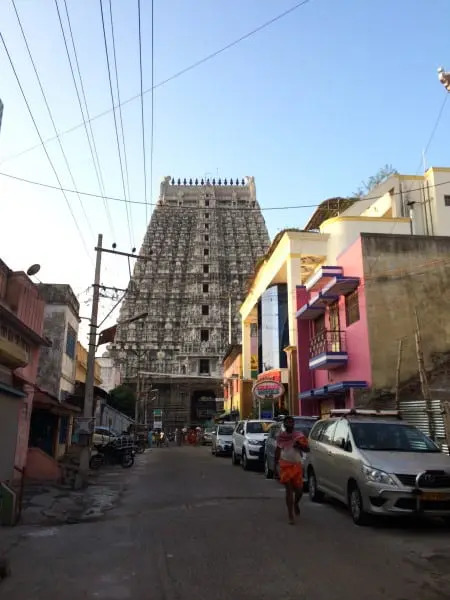 The Girvalam is a purifying ritual, which involves circumnavigating the base of Arunachala barefoot. We keep our shoes firmly on our soft, clean western feet, but walk with and past many folks, who are indeed barefoot. 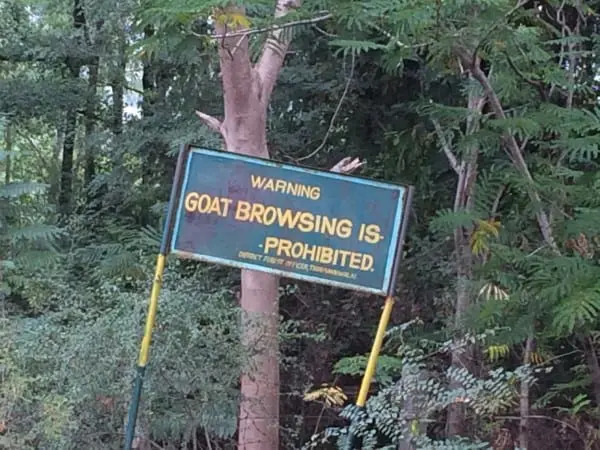 And I still have no idea why goat browsing is prohibited. We’re approached by several westerners attempting to have us join a spiritually uplifting discussion at their ashram. 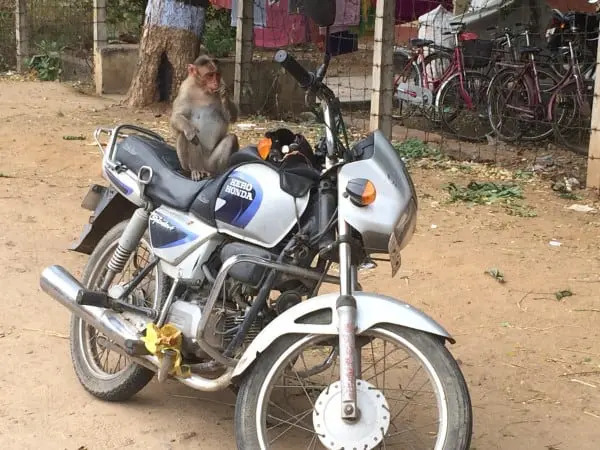 We decline, heading to the Sri Ramana Ashram book shop where we buy a 15 INR Giripradakshina map. 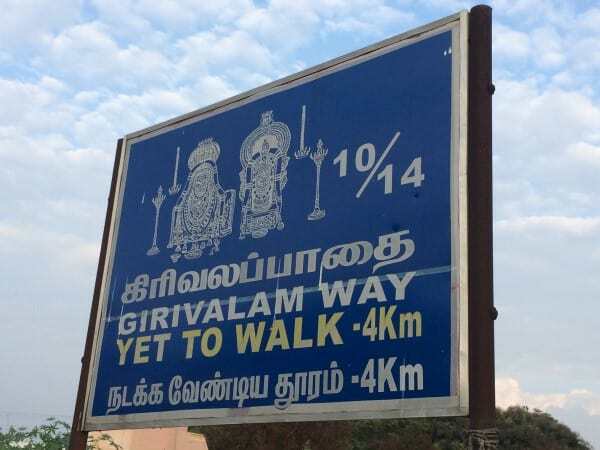 This will allegedly guide us on the 14 kilometer Giravalam. It turns out we don’t need it. In reality, the map is next to useless. There are signs everywhere and it’s easy to spot the eight linga (or Shiva representation used for worship in a temple) along the route. If you miss a sign, you can always follow the trail of bearded, red and orange robed devotees. 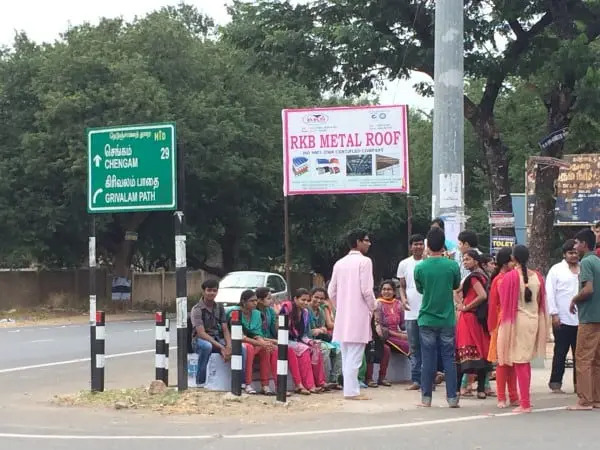 They wait, sitting by the side of the road, usually with a hand out for your donations. And all the while, life goes on.. In public. It’s a pleasant walk. There isn’t much traffic, and while we were there, there weren’t crowds. No one really bothered us. 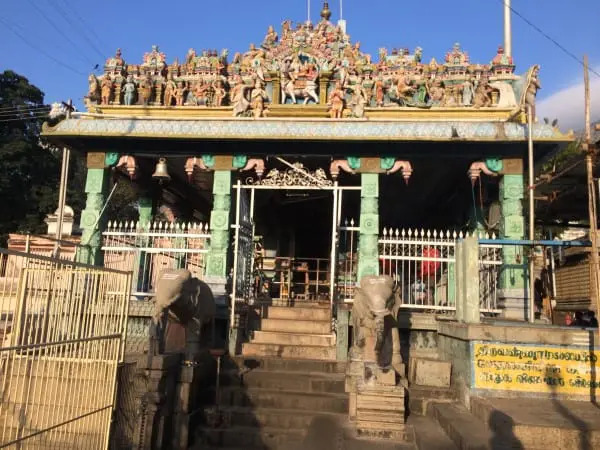 We peered into temples en route, from a distance and enjoyed the experience of stretching our legs. Back in the town, we find sustenance, a glorious church and an early night. 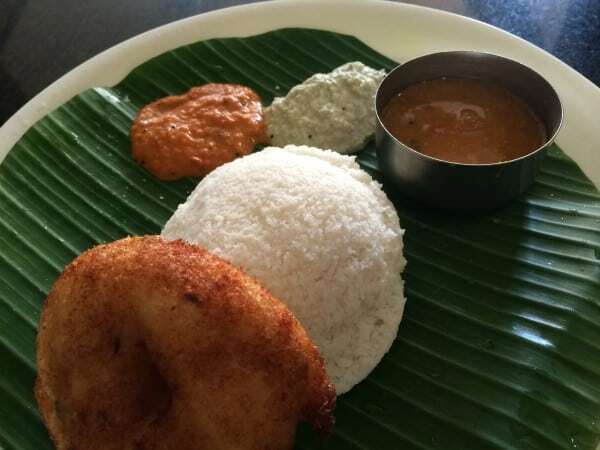 Breakfast here in South Indian is a wonderful experience – Idli, Vada and accompanying curries and chutneys are to be found in most places. 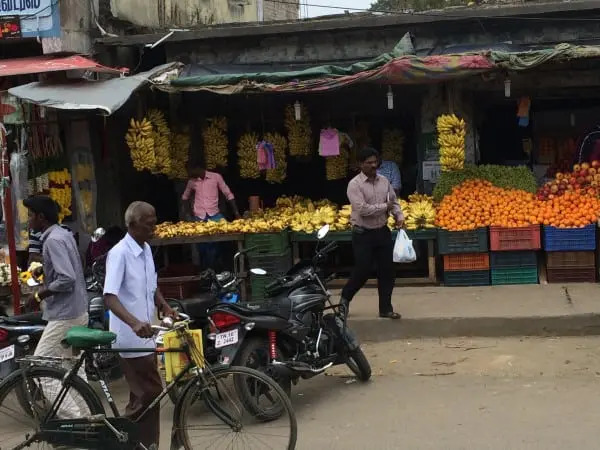 It’s a meal that we’ve come to really enjoy, so we stock up before heading to the Arunachleshwar Temple, just a few minutes walk from the Sri Sudharsana hotel, where we’re put up for the night. 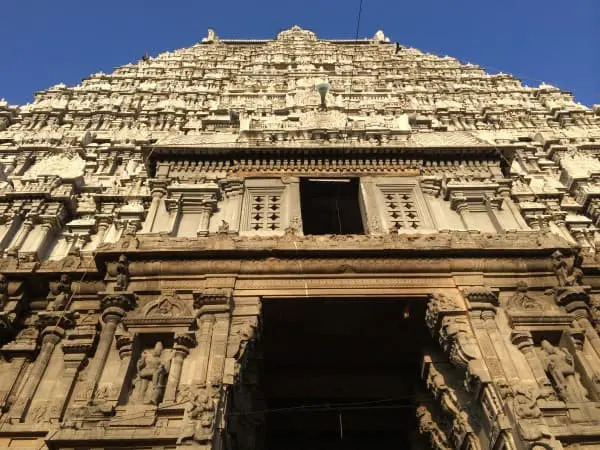 This is one of the largest temples in India, measuring some 10 hectares and with parts of it dating back to the 9th century. 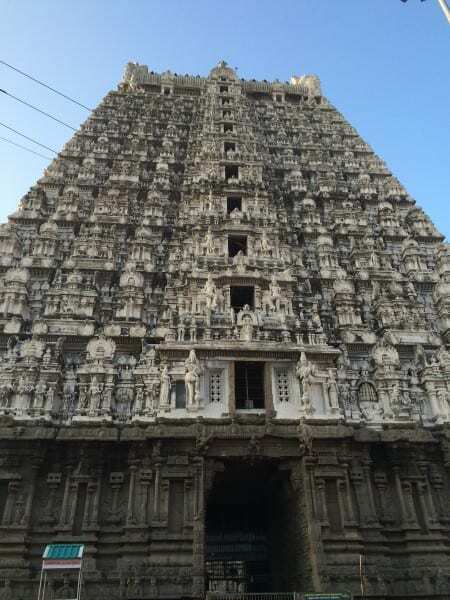 There are four gopurams marking the entrances, with the primary eastern one rising 66 meters. 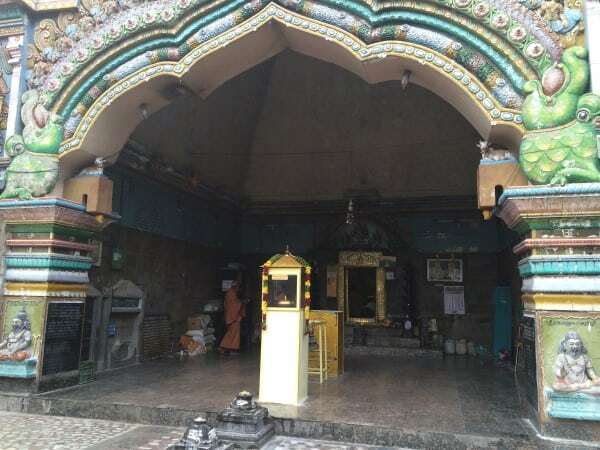 Five more gopurams, tanks and sub temples can be found inside, along with a profusion of folks. There’s a temple elephant here, who for a small fee will pass his blessing on you. Sadly we can’t find him so we spend the time observing. There are supposed to be no photos here, but no one pays this any attention. 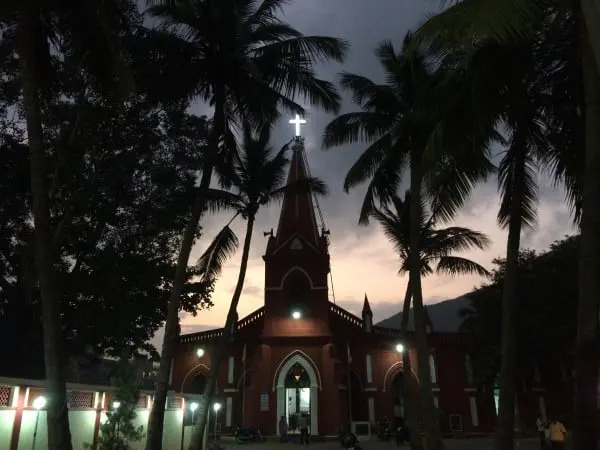 It seems that people spend more time taking photos than observing any religious ritual. We had to leave our shoes outside again, this time under the guardianship of a squatting man with a pile of chappals or sandals in front of him. Our Merrells stand out like a sore thumb. 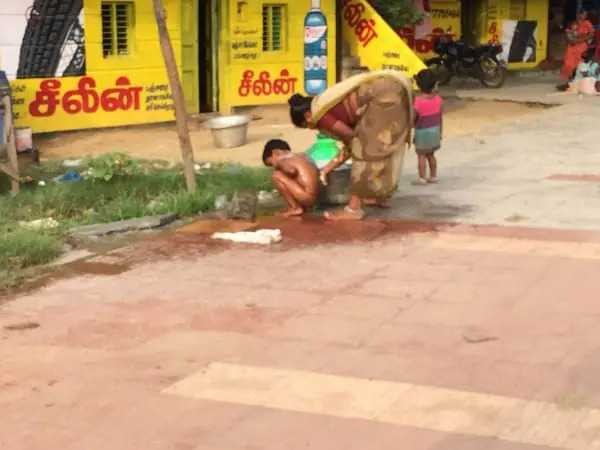 They are, much to our relief, still there when we return and when we hand over 10 rupees as payment for his “services”, as we see others doing, he almost spits his indignation at us with a “100 rupees, 100 rupees” cry. My practiced look of disdain indicates that I can’t figure out what planet he’s on goes unnoticed. I am, after all, just a western woman and not worthy of his time, but apparently worthy of 100 rupees. 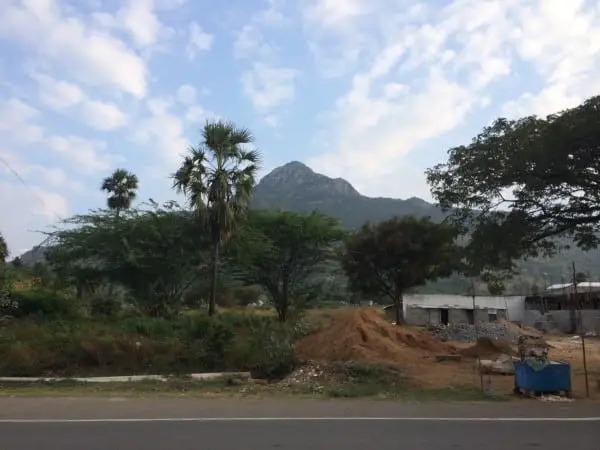 Mount Arunachala is just 800 meters high, an extinct volcano and if we’d listened to the 5am alarm that we’d set would have made a fabulous hike. 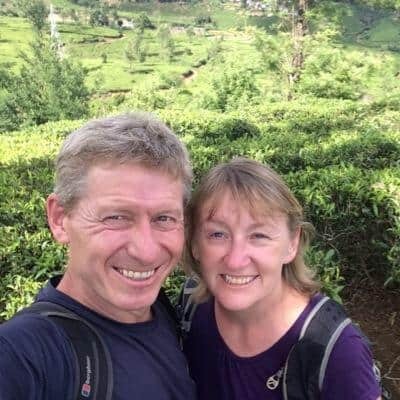 Barefoot pilgrims do make this hike, but now in the heat of the day we give it a miss and head on our way. 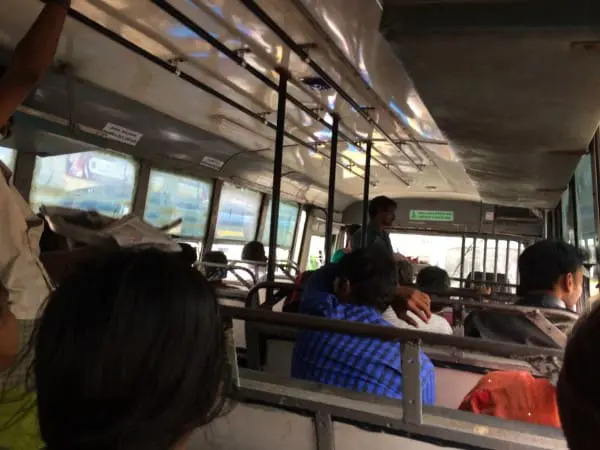 We leave Tiruvannamalai on another local bus – it’s either that or we take a car and driver – and this way we get to experience more of India, although sometimes the air conditioned comfort of a car and driver would be pleasant. 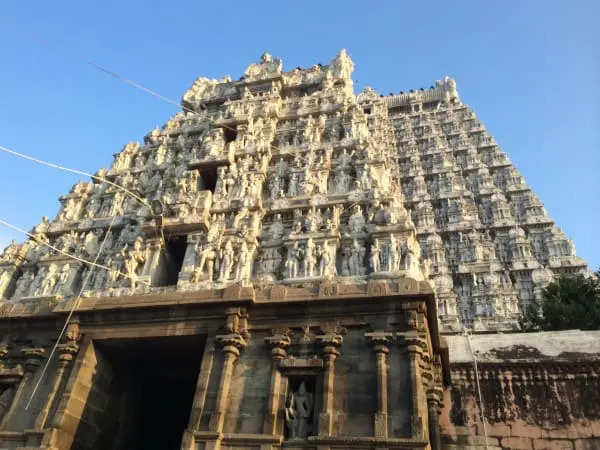 Our next destination is Kanchipuram. We’re still on the temple trail.